The sand equivalent test (Figure 1) is a rapid field test to show the relative proportions of fine dust or clay-like materials in fine aggregate (or granular soils). The term “sand equivalent” expresses the concept that most fine aggregates are mixtures of desirable coarse particles (e.g., sand) and generally undesirable clay or plastic fines and dust (ASTM, 2003).These materials can coat aggregate particles and prevent proper asphalt binder-aggregate bonding. 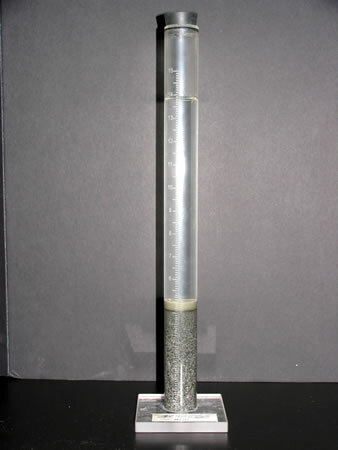 Figure 1: Sand equivalent cylinder with aggregate sample. In the sand equivalent test, a sample of aggregate passing the No. 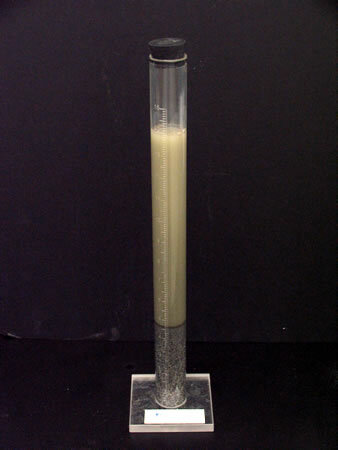 4 (4.75 mm) sieve and a small amount of flocculating solution are poured into a graduated cylinder and are agitated to loosen the clay-like coatings from the sand particles. The sample is then irrigated with additional flocculation solution forcing the clay-like material into suspension above the sand. 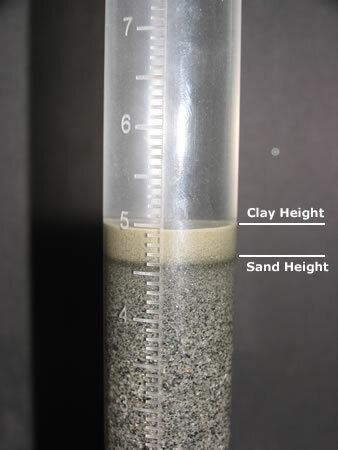 After a prescribed sedimentation period, the height of flocculated clay and height of sand are determined and the sand equivalent is expressed as a ratio of the height of sand over the height of clay. Higher sand equivalent values indicate “cleaner” (less fine dust or clay-like materials) aggregate. Excessive dust or plastic fines (clay-like fine particles) in HMA aggregate can contribute to a lack of stability (rutting or shoving) or moisture damage and stripping. A simple test to determine whether or not a particular aggregate has enough dust or plastic fines to make a HMA mixture unstable or susceptible to stripping is valuable in preventing the manufacture of poor performing mixtures. Three tests used to determine the plastic fines and dust in aggregate have received the most attention in the U.S. These tests, the sand equivalent, plasticity index and methyl blue, are described here based on work by Kandhal, Lynn and Parker (1998). The sand equivalent test, described in the Test Description section, separates out a fine aggregate sample’s sand and plastic fines and dust portion to determine the content of the latter. lower sand equivalent values indicate higher pastic fines and dust content. Minimum specified sand equivalent values for fine aggregate in HMA range from 26 to 60 with the most common being 45. The requirement is also dependent upon the type of HMA layer (e.g., base course or surface course). The sand equivalent test is not a direct measure of a HMA physical property. Rather, it is a measure of plastic fines and dust in the aggregate. These items may contribute to a reduced asphalt binder-aggregate bond. Therefore, if a sand equivalent test is satisfactory, it is unlikely that plastic fines and dust in the aggregate will be a HMA performance problem. However, if a sand equivalent test is unsatisfactory, further investigation may be warranted. Some agencies perform the test on material with a top size smaller than the No. 4 (4.75 mm) sieve. This is done to avoid trapping the clay-like or plastic fines and dust below flaky shaped No. 4 to 8 (4.75 to 2.36 mm) sized particles. Testing smaller top sized material may lower the numerical results of the test (ASTM, 2003). Aggregates recovered using the ignition furnace appear to be unsuitable for sand equivalent testing because it appears the burning process creates more material that will show up on the sand equivalent test as clay (Prowell and Carter, 2000). Plasticity Index (PI) is the difference between the liquid limit and the plastic limit of the material passing No. 40 (0.425 mm) sieve. The PI can indirectly indicate the type and amount of plastic fines (Roberts et al., 1996). Therefore, some specifications (ASTM D 1073, Standard specification for Fine Aggregate in Bituminous Paving Mixtures, and ASTM D 242, Standard Specification for Mineral Filler for Bituminous Paving Mixtures) limit the PI of the aggregate fraction passing the No. 40 (0.425 mm) sieve to a value of 4 or less. Kandhal, Lynn and Parker’s (1998) review of literature indicated no reported correlation between the PI and the field performance of HMA. 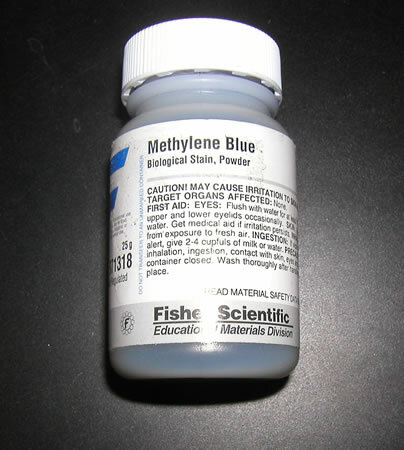 This test adds quantities of a standard aqueous solution of methylene blue (MB) dye (Figure 2) to a sample of dry fine aggregate passing the No. 200 (0.075 mm) sieve until adsorption of the dye ceases. The MB solution is titrated step wise in 0.5 ml increments from the burrette into a continually stirred fine aggregate suspension. After each addition of MB solution and stirring for one minute, a small drop of the aggregate suspension is removed with a glass rod and placed on a filter paper. Initially, a well-defined circle of MB-stained dust is formed and is surrounded with an outer ring of clear water. Successive additions of MB solution are repeated until the end point is reached when the ring of clear water turns light blue. The MB value of a specific fine aggregate fraction is reported as milligrams of MB per gram of fine aggregate. The MB value essentially expresses the quantity of MB required to cover the total surface of the clay fraction of the sample with a single-molecule layer of MB. Therefore, the MB value is proportional to the product of the clay content times the specific surface of the clay (Hosking, 1992). Higher MB values indicate more clay. Based on their test results, Kandhal, Lynn and Parker (1998) recommended the MB test over the sand equivalent test as the one that is “best related to stripping in HMA”. However, Woodward, Woodside and Jellie (2002) point out that the MB test is rock type specific and its application to rock types other than basalt can be a problem. A small sample of fine aggregate passing the No. 4 (4.75 mm) sieve is placed in a graduated cylinder and mixed with flocculant solution to separate fine dust of clay-like particles from the rest of the aggregate sample. The sample is shaken and then allowed to sit for 20 minutes. The height to the top of the sand particles is expressed as a percentage of the height to the top of the fine/clay-like particles. Figure 3 shows the major sand equivalent test equipment. Figure 3: Major sand equivalent test equipment. Time to dry the aggregate sample can vary but generally takes no longer than 1 hour. Test time, including sample splitting, takes about 40 minutes. 1. Obtain a sample of aggregate passing the No. 4 (4.75 mm) sieve. 2. Split this sample to obtain a little more than four 3 oz. (85 mL) tin measures (Figure 4) of material (about 12 oz. or 340 mL). 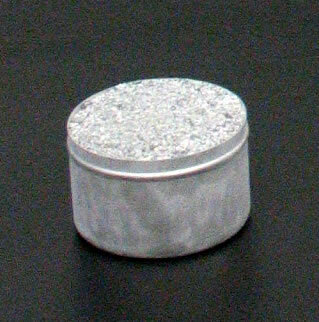 Figure 4: Aggregate sample in 3 oz. (85 mL) tin. Air-dry. Fill the 3 oz (85 mL) tins with air-dry material and tap the tin while filling to get the most possible material into the tin. Pre-wet. Either use an already-wet sample or wet the sample to obtain a condition where the sample is just wet enough for form a cast in your hand when squeezed. After the proper wetness is obtained, split the sample by placing it on a cloth and rolling it by picking up a cloth corner and lifting it to the diagonally opposite corner. When the material appears homogeneous, fill the tins with material. Oven dry. Get the test samples by one of the two above methods, let samples dry to a constant mass at 230°F (110°C), then cool to room temperature. Samples on aggregate proposed for use in HMA should be oven dried if acceptance of HMA aggregate material is based on samples obtained after the HMA plant’s aggregate drier. 4. Siphon 4.0 inches (101.6 mm) of calcium chloride solution into a graduated plastic cylinder. 5. 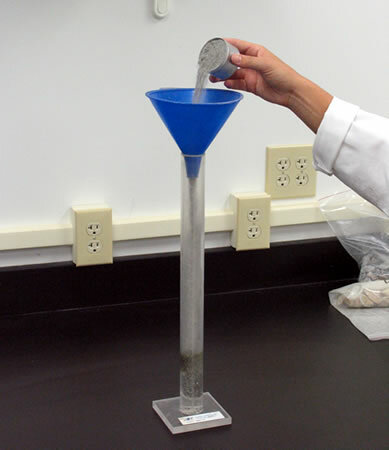 Pour a prepared test sample from the measuring tin into the cylinder using a funnel (Figure 5). Tap the cylinder bottom to make sure the sample is thoroughly wetted by the calcium chloride solution. Figure 5: Pouring a sample into the graduated cylinder. 6. Let the wetted sample sit for 10 minutes. Mechanical shaker. Set the timer and shake for 45 seconds. Manual shaker (Video 1). Place the cylinder in a manual shaker and shake for 100 cycles. Hand. Shake the cylinder by hand in a horizontal linear motion for 30 seconds using a throw of about 9 inches (229 mm). Shake with the forearms only. http://www.youtube.com/watch?v=EXprLIr39uAVideo 1: Mechanical shaking device for the sand equivalent test. 8. Irrigate the sample. Place an irrigator tube into the sample and use the irrigation to wash the sample off the cylinder walls as the tube is lowered. Move the tube all the way to the bottom of the cylinder by gently stabbing and twisting the tube to get it through the aggregate sample. Continue the stabbing and twisting action to flush the fines upward until the cylinder is filled to the 381 mm mark. 9. While continuing to irrigate, raise the irrigation tube out of the cylinder so that the liquid remains at the 381 mm mark. 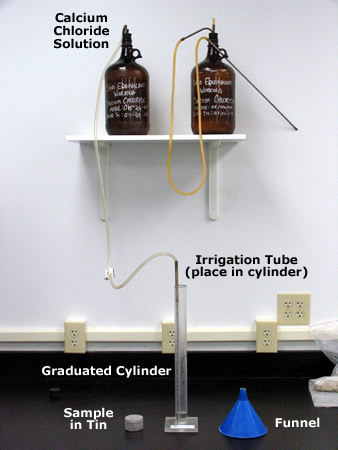 The volume of the irrigation tube is replaced by liquid volume as the tube is removed (Figure 6). Figure 6: Cylinder after shaking and irrigating – clay has not settled. 10. Allow the cylinder with sample to sit undisturbed for 20 minutes. 11. Record the level at the top of the clay suspension. Record this as the “clay reading” (Figure 7). Figure 7: Close up of cylinder showing clay and sand height. 12. Insert a weighted foot assembly into the cylinder until the foot comes to rest on the sand surface (Figure 8). Read the indicator mark on the weighted foot assembly and subtract 254 mm from this level to get the sand level (the indicator is 254 mm above the bottom of the weighted foot). This value is the “sand reading” (Figure 7). Figure 8: Weighted foot assembly in the cylinder. Note 1 Requirements are based on the expected loading in the design lane for a 20-year period regardless of the anticipated design life. Sand equivalent values can vary widely depending upon aggregate source, quarry washing and storage procedures. Typical sand equivalent values range from less than 30 to more than 90. The sand equivalent value should be reported to the nearest higher whole number. For example, if the SE equation gives SE = 38.25, the reported SE should be 39.